Pittsburgh, PA (September 20, 2016) – Howard Hanna Real Estate Services was once again recognized as the #1 residential real estate firm in the region with 17,925 homes sold and $3.7 billion in closed sales last year. 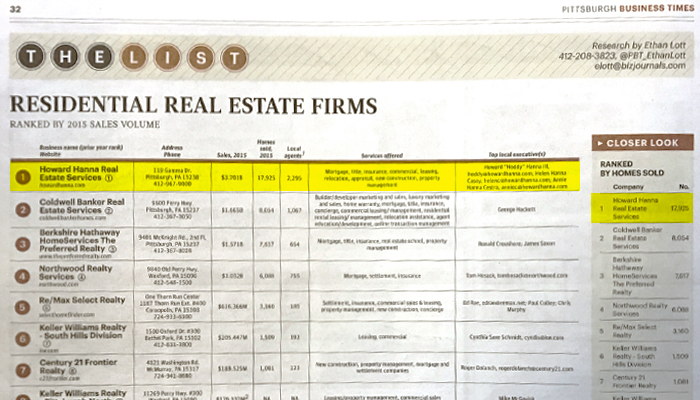 Pittsburgh Business Times, Annual List of Residential Real Estate Firms, September 9, 2016 edition. Howard Hanna sold 123% more homes in the market area during 2015 than their nearest competitor. Additionally, Howard Hanna had over 140 agents listed in the Pittsburgh Business Times annual list of Top-Selling Realtors. This list is a Who’s Who of local agents whose sales topped $5 million last year. I am so VERY glad to be a part of such a GREAT company! A very huge part of the American Dream across the board for everybody. It is so “cool” to watch the company grow, each and every year with so many people included in this amazing company, truly changing the world step-by-step and day-by-day! Thank you!